I got to know Jim Henderson when he served in the Maine Legislature. Later, he became Secretary of State and then State Archivist (if I remember correctly, Jim had a PhD in history). As state archivist, Jim would occasionally call me to tell me about some interesting thing they had found while shuffling through old state records. 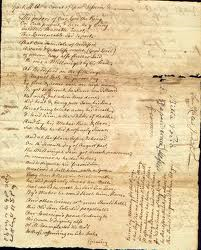 In this case, he called me to tell me about a curious poem that had been found on the back of some papers from the York County Court of General Sessions, dated October 1734. I love history and I absolutely loved this story. Unfortunately, UPI was on its last legs in the late 1980s and I’m not sure if this story was ever published. AUGUSTA, Maine (UPI) – It wasn’t much of a crime, not even for the town of Biddeford in 1734. Old Sam Cole got drunk one warm summer’s night and beat up his son, Sam. Jr.
Two days later, Cole was drunk again. And once again, Sam. Jr. was the object of his father’s rage. This time, Old Sam didn’t beat up his son; instead, he just threatened to shoot him dead. All of this earned the elder Cole a Grand Jury indictment, and a visit to the Court of General Sessions in York. Just as it wasn’t a big crime, it also wasn’t a big court case. The prosecutor looked over the charges, decided that a lot of people got belligerent when they drank too much, and asked that the charges be dismissed. The court agreed, and Old Sam was off the hook. 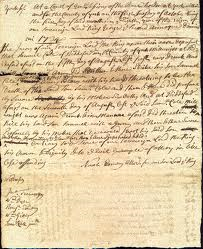 Normally, the case of Sam Cole wouldn’t have created much interest among researchers at the Maine State Archives, where ancient court records from York County have been under review for the past two years. What has the researchers wondering is the poem that someone scratched out on the back of Sam Cole’s court papers.